← 2 stories: Algiers Indy Animal Shelter & Capstone Free Fruit Tree Project (May 2015. NewOrleans.me). 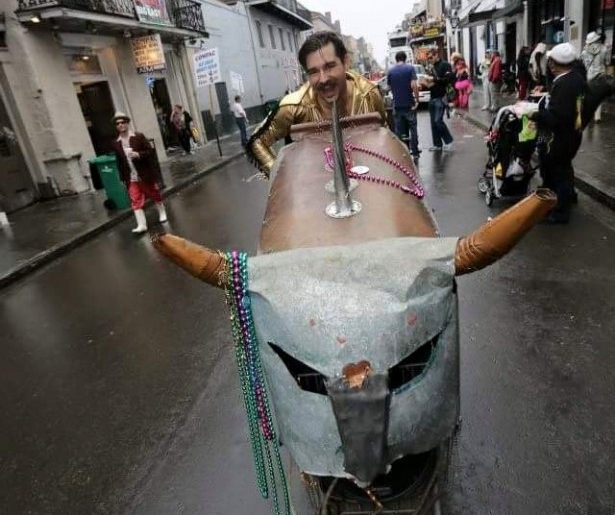 5 pieces: Bacchanal What Now?, St Roch Market, Bunarchy Ball, Techno Bull and the Wild Lotus Band (NewOrleans.me. May 2015). 1) Bacchanal: New Orleans’s music community, food community and its drinking community were all saddened to lose Bacchanal wine bar owner Chris Rudge on March 13 in his sleep of heart failure at the young age of 40. More than just a business owner, Rudge will be remembered as having started a community verging on family, and showing a lot of people the time of their lives. In the meantime, the iconic business and brand he founded continues to operate, adapt and grow. “We’re hanging in there, super busy,” says Bacchanal co-owner Beau Ross, who knew Rudge since their college days planning parties together in Tallahassee, Florida in the early 90s. Ross owns Bacchanal along with Chef Joaquin Rodas; both were part owners for the last two years, with verbal agreements stretching back five or so years. 2) St Roch Market: This weekend, The St. Roch Market opens – or rather, re-opens, but with a different feel, different purpose and what will surely be a different clientele. Outside, the market’s facade looks handsome and traditional. A mass of shiny silver chairs gleams invitingly out front. Another army of chairs in back faces the St. Roch neighborhood and its recently refurbished neutral ground. How the market will fit into the neighborhood it is named for remains to be seen, but like the bright orange Healing Center across the street, it will likely change the area while serving it. 5) Wild Lotus Band: Wild Lotus is not only a successful chain of local yoga studios, with locations Uptown and in the Marigny, but also a live local band that plays its own modernized, New Orleans version of Indian “kirtan” music. “The lyrics are mantras – some are Sanskrit words,” explains Wild Lotus band leader, Sean Johnson, a vocalist who also plays the harmonium. “It’s all energy based sound, sung to change our stage of consciousness.” Despite the obscure genre, the ten-year-old band fits easily into New Orleans. With Alvin Young on bass and guitar, and vocalist Gwendolyn Coleman on percussion from the cajon to the frame drum, Wild Lotus entrances unsuspecting crowds at events like the Jazz and Heritage Festival, which hosted the band this year.